From downtown Vancouver, take the #19 bus to the Stanley Park Loop. Take a short walk south past the Dining Pavilion to Malkin Bowl. Go to http://tripplanning.translink.ca/; enter 610 Pipeline Road or Malkin Bowl as your destination or departure address, to get specific bus times. 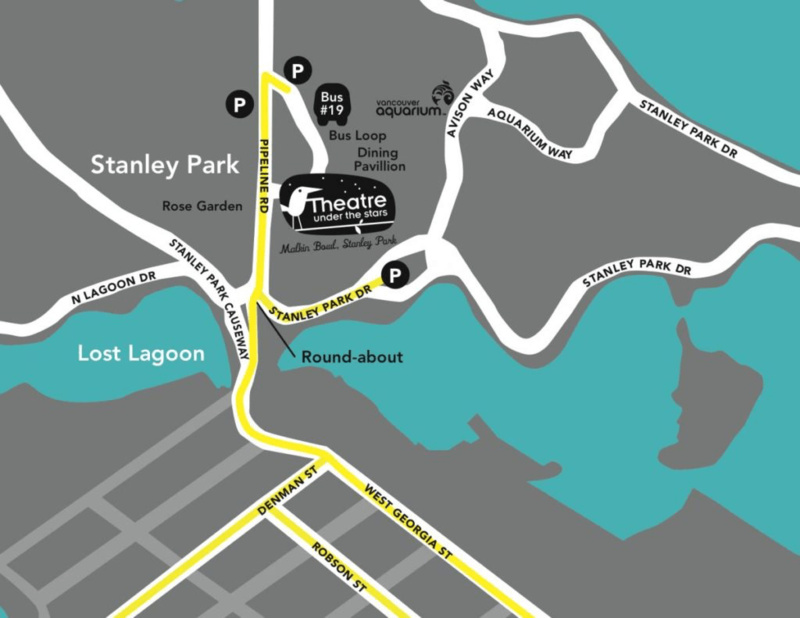 When leaving the theatre you can catch it at the Bus Loop behind the Stanley Park Dining Pavilion. Drive on Georgia Street northbound, towards Stanley Park in the right hand lane. As you enter Stanley Park, you will come up to a round-about. Drive straight through the roundabout, past the Rose Garden sign and take the first right. Theatre signage will be directly in front of you. Continue along past The Stanley Park Dining Pavilion for parking in front of the Children’s Zoo. Come over the Lions Gate Bridge, pass through Stanley Park and turn around at Denman Street. Head back towards Stanley Park and follow the above directions. From the roundabout, take the second right hand exit onto Pipeline Rd, drive past the turn off to Malkin Bowl on your right and the Horse Barn Parking Lot on your left. Take the next right hand turn into the Children’s Zoo Parking Lot. From the roundabout, take the second right hand exit onto Pipeline Rd, drive past the turn off to Malkin Bowl on your right. Take the next left hand turn into the Horse Barn Parking Lot. From the round-about take the first right hand exit onto Stanley Park Drive and carry on 100m. Take the next left hand turn into the Stanley Park Dr. Parking Lot. For fast payment upon arrival, patrons are invited to download the Easy Park app in advance. From the roundabout, take the second right hand exit onto Pipeline Rd, drive approximately 100 meters and take your first right toward Malkin Bowl. This will take you the drop off point for Malkin Bowl and special needs parking. From the drop off point you can carry on to the Children’s Zoo Parking Lot.